When using a VPN, it is important that all traffic is routed through VPN tunnel. Under certain conditions, Windows will use its default DNS servers instead of the DNS server of your VPN service provider. This is known as “DNS Leak” because it leaks your data instead of sending it through the secured path. Ivacy offers Secure DNS add-on to prevent DNS leak. If you use this feature, Ivacy will change preferred DNS to 8.8.8.8 and Alternate to 208.67.222.222. 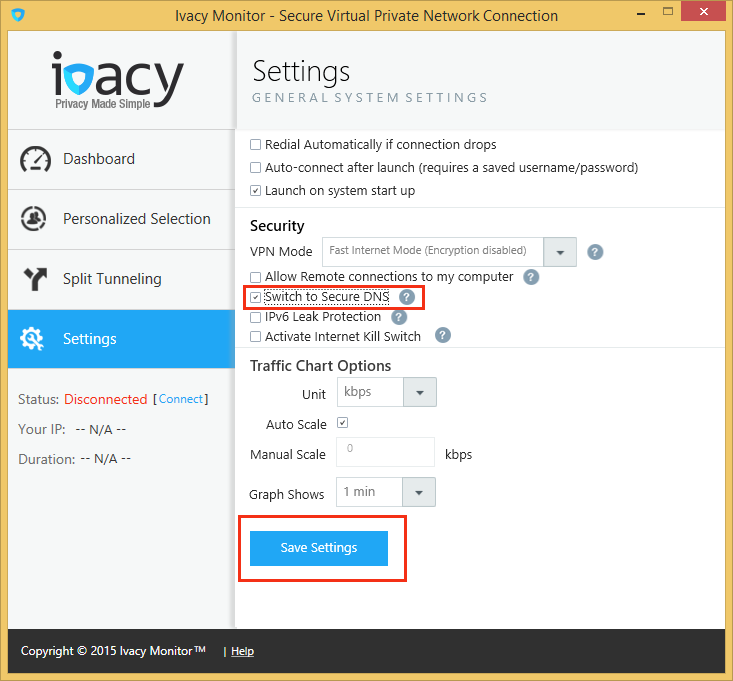 In order to activate Secure DNS, you have to run Ivacy Windows application with admin rights and follow following steps. Click “Settings” in Ivacy’s Windows dialer. Under Security, select “Switch to Secure DNS”, by ticking the check box. Go to “Dashboard”, select desired protocol, purpose, username and password (the email address and the password are the same that you chose at the time of order placement), check “Remember Me” and click “Quick Connect” button. Note: If you want Ivacy to always run with admin rights, you have to open Ivacy properties; under “Compatibility” tab, select “Run this program as an administrator”.